ALPHARETTA, Ga., Oct. 11, 2011 (SEND2PRESS NEWSWIRE) — InnoVergent (www.innovergent.com), a technology consultancy firm and reseller of cloud computing accounting software, was recognized as a 2011 President’s Club member by Intacct (us.intacct.com), a leader in cloud financial management and accounting software. Membership in the Intacct President’s Club is based on sales success and client service. InnoVergent specializes in cloud-based solutions for start-ups, newly funded, and professional services organizations throughout the United States and Canada. Intacct is the cloud financial management company. Bringing cloud computing to finance and accounting, Intacct’s award-winning applications are the preferred financial applications for AICPA business solutions. Intacct applications are used by thousands of organizations from startups to public companies and are designed to improve company performance and make finance more productive. Additional information about Intacct is available at http://www.intacct.com . 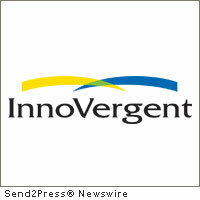 InnoVergent, an Intacct Certified Partner, serves small to medium sized businesses with technology consulting, software selection assistance, integration services, web-based, cloud computing financial and professional services solutions that are quickly deployed and feature rich. Founded in 2006, InnoVergent promises the InnoVergent Advantage to all its customers: a focus on your business needs first, quick and positive results, and a solution that works the way you work. More information: http://www.innovergent.com . Original Keywords: Paul Cammisa, InnoVergent, Intacct President’s Club, cloud financial management company, technology consulting, software selection assistance, integration services, web-based, cloud computing financial and professional services, SaaS, Georgia business news, Weaver Stephens Group InnoVergent Alpharetta Georgia ALPHARETTA, Ga.
REFERENCES: Awards and Honors News, Paul Cammisa, InnoVergent, Intacct President's Club, cloud financial management company, technology consulting, software selection assistance, integration services, web-based, cloud computing financial and professional services, SaaS, Georgia business news, Weaver Stephens Group InnoVergent Alpharetta Georgia ALPHARETTA, Ga.